In our monthly rental market reports, we continue to see a striking trend in Austin: sellers taking their home off the market at increasing rates each month. While there are many reasons your home doesn’t sell, we find there are really three umbrella reasons why: the home’s physical defects, a buyer’s shopping experience and letting emotions get in the way. Our Why Your Home Won’t Sell in 2019 series will cover all of these reasons in detail. Just like shopping for anything else, a buyer’s shopping experience matters. That’s why Nordstrom plays soft music, has comfortable chairs and keeps their stores at a comfortable temperature at all time – you want to make the buyer linger over your home’s online listing as well as in the home itself when they see it. The more they research your home, the more they will start to see themselves living there. If you’re looking to sell your home quickly and for top dollar, make sure you avoid these common pitfalls. Online experience and shopping have come a long way. Buyers are accustomed to researching and evaluating a purchase online first. So you have to think of the photos and your online marketing as your home’s first showing. The better the photos, the more excited buyers will be about getting in their car to tour it in-person. Poor photos are a poor representation of your house and even if it shows well in person, you will lose many buyers who rule it out online. 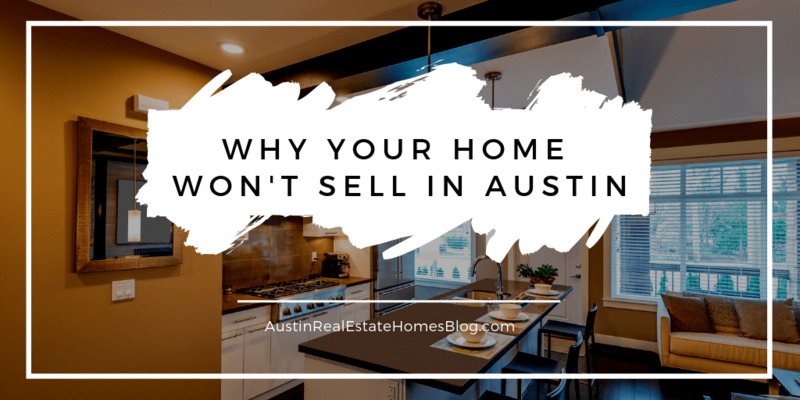 Additionally, Austin in particular attracts many relocation buyers, so some can’t tour your home in person easily. To help those buyers, we use a Matterport 3D tour that allows buyers to walk through your home virtually from their computers. This tour has helped attract more qualified in-person showings, so sellers don’t prepare for in-person showings from people who aren’t serious about their homes. Dirty dishes, laundry on the floor, pet odors are all things that a buyer notices. When they come into a home that wasn’t prepared to show, they often ask themselves what else is wrong with the house. Think of this as walking into a clothing store that wasn’t organized overnight. You aren’t going to sort through a mess and neither will home buyers. The way we live in a house and the way we live in a house when we’re trying to sell it are two different things. One of the easiest things you can do to is pack items you won’t need until you get into your next home. The more you can pack and store, the bigger your house looks. Keep only the essential clothes in your closet. Clear off bookshelves and built-ins so they look full, not overly stuffed. If you won’t need it, put it in a box, label it and move it out. We all know showing your home is inconvenient. The only thing more inconvenient is having that process go on longer than it has to. Try to be as accommodating as possible for showings. You never know when the person who is going to buy your house will see it. Often times, buyers are coming in from out of town and have set times where they are able to see homes. If you miss their window, they might not come back. Have a family game plan to get out of the house quickly. Try to clean up regularly so you don’t panic when you get a call for a showing. You won’t always get a lot of notice, so the less you have to do to get out, the more accommodating you can be to showing requests. Buyers need to be able to imagine themselves living in your home. If you are there, hovering over them, they will just want to get out of there as quickly as possible. Make a plan to leave for showings, so you can give the buyers the space and privacy to fall in love with your home. Come up with a list of places you can go (coffee shops, parks, restaurants) so you aren’t aimlessly driving around waiting for the buyers to be done. No one likes it when sales people hover in a store, and that’s how a buyer will view your presence in the home. Ready to Sell Your Austin Home? We are too! We’re not in the business of taking listings that don’t sell. We’ll help you prepare your home to meet the market and sell faster and for more money. Our home marketing plan is quite simply the best in the industry. Learn more about it at Austin Home Sellers. Then call us at (512) 827-8323, fill out our Seller Survey or email us at info@11OaksRealty.com to schedule a no obligation consultation.